MINNEAPOLIS, Minn. -- Jonah Mortenson cut Edina's lead in half, early in the third period, but the Hornets responded with three goals in a span of two minutes, 17 seconds, to cruise to a 5-1 win over Benilde-St. Margaret's and a berth in next week's Class AA State Tournament. The 10th-ranked Red Knights suffered their second 5-1 loss of the season to top-ranked Edina, but the games took different baths. In the teams' meeting, Nov. 29, the Hornets jumped out to a 4-0 lead in the first period before the teams played even hockey over the final two periods. In the section championship, the game started out evenly as the teams played a scoreless first period before Mason Nevers scored a 5-on-3 power-play goal, 3:26 into the second period. The score remained 1-0 unit the third period when Brett Chorske talled 67 seconds into the final frame. BSM cut that lead in half when Jonah Mortenson converted a Charlie Bischel pass out of the right corner into his eighth goal of the season. For over five minutes, the scored remained that way but Edina got three quick goals and, with 4:25 to play, enjoyed that four-goal lead until the final buzzer.The Hornets held a 27-10 advantage in shots on goal. Adam Marshall, with three, was the only Red Knights to tally multipe shots. 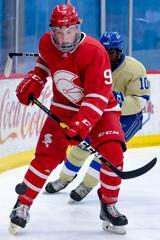 BSM finishes the season with a 20-8-0 record and, for the first time in five seasons, reached the 20-Win plateau. Adam Marshall was the lone Red Knight to record multiple shots on goal, registering three.